Anyone who rides a bicycle in any sort of urban environment knows the dangers of inattentive motorists. That tiny bell on your handlebars is great if you want to get the attention of a pedestrian or another bicyclist, but to grab the attention of that guy blasting Skrillex from his car, you may need something with a few more decibels. A few more decibels, yes, but probably not a system that’s so loud, it deafens everyone nearby and makes bike riding a chore. The Hornster doesn’t just emit a few more decibels than the average bicycle bell — it explodes with 178 decibels. At 140db, even shorts bursts of noise can cause hearing damage. Louder than the Concorde superjet, this horn/bicycle combo isn’t only dangerous for anyone within earshot, it’s nearly worthless for real-world cycling. What happens when you combine one of the most esteemed product design and "innovation consultant" firms in the world, a highly respected custom bike builder, and the latest battery technology and then tell them to build the ultimate utility bike? "It feels like you've always got a tailwind," remarked Reinick. An e-powered tailwind would sure come in handy in hilly San Francisco where this team is based. Electric motors power both the bike (via a front hub motor with internal routing of all cables of course) and some seriously bright lights (see below). The lithium-ion batteries are the same ones used in the brand new Chevy Volt and they're only about 2 inches in diameter — which makes them fit perfectly into the Faraday's twin top tubes. Hyperbole alert. You’ve been warned. Easy, Secure, Beautiful. Machined from solid aluminum, the Blink/Steady bike light turns on automatically and shuts off when you’re not riding. There’s no need to remove it when you lock up because it’s secured by your seatpost. Our elegant, low-profile design is the bike light you’ve been waiting for – please help us make one for you! 100copies is the brainchild of Singapore Creative Director Thomas Yang. An avid cyclist, he decided to combine two of his passions – bicycles and art – into 100copies. All of the products you see here are original designs created by him and are limited to, as the name suggests, 100 copies. Each piece of work will be watermarked, labeled with the title and edition number. As such, no two copies are ever completely identical. If you would like to contact 100copies with suggestions, comments or anything else that might go through your mind, please drop us an email. The organizers for the Pinchflat event. Left to right: Courtney Michard, Katie Dune, Bill Ferriot, Jessie Glover Boettcher, and Jeremy Slagle. 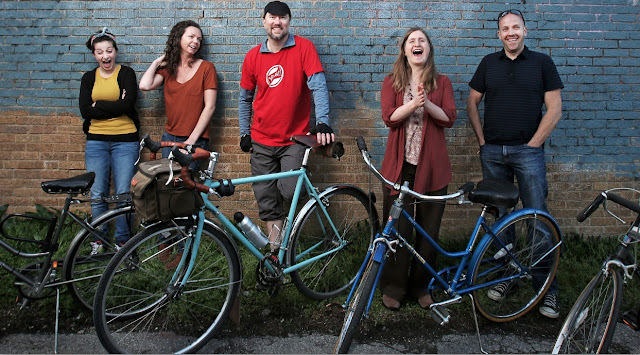 May is Bike Month at Wild Goose Creative. For the full month, Wild Goose Creative will display posters by over 30 central Ohio artists who have been inspired by bicycles and the cycling culture of Columbus. These posters are meant to inspire bike riding, celebrate the art and craft of bikes, and invite thought about bikes as an important way to get around Columbus. Each limited-edition poster is $30, and is beautifully designed and printed especially for Pinchflat 2012. On Saturday, May 5, Wild Goose Creative will host the Pinchflat Bicycle Poster Blowout, which will be fun for the whole family. This event will feature two bike rides, live music, great food donated by local restaurants, vendors peddling their coffee and sweets, t-shirt printing, artist-designed coloring book pages, a printing workshop, a raffle for products and services from local businesses, and more. This event is created to please people who like posters, bikes, local art, or all of the above. This event is free, and open to the public. The first 100 guests will receive a free gift bag. During May 5’s Gallery Hop evening, Paradise Garage in the Short North will showcase the artwork. Throughout the month of May, Seagull Bags in downtown Columbus will present and sell all the posters. After May 5, posters can also be purchased at pinchflatcolumbus.com. Presenting sponsors include Wild Goose Creative, Jeremy Slagle Design, Yay Bikes!, BikeOSU, Graham Erwin Design, Make Believe Monsters, Paradise Garage, and Seagull Bags. Pinchflat is made possible by grants from The United Way of Central Ohio, The Ohio Arts Council, and the Columbus Foundation. have had some very fun excursions on rail trails, disused railways turned into pedestrian/bike paths. The trails typically go through very beautiful areas and rarely do you have to concern yourself with motorized traffic of any kind. Have something to say about bicycling? Can you do it in five minutes with 20 slides lasting 15 seconds? Then submit a proposal to present your compelling message on the final night of bike month. Topics may include your unique take on bikes in history and culture, a vision for a bike-able community, a positive effect of cycling or just a darn good bike story. Some examples of topics s we have in the works are: "Can Bicycling Make You Smarter? ;" "Bike Propaganda" and "The Fascinating History of the Bicycle." Submit a proposal: Send a brief title and description of your presentation to Rich James (rjameso1@cscc.edu) by May 15th so we can plan the agenda. We may not be able to accommodate all proposals. To learn more about bike activity at Columbus State visit cscc.edu/bike. Talk about it on the Cougar Cranks Facebook page. The Next Big Thing (TNBT) is an event where presenters, within creative constraints, share an idea, story, or vision on a theme. The goal is to instigate creative thinking and conversation that carries on beyond the event itself. Who organizes The Next Big Thing? TNBT is a partnership between the Columbus State departments of Human Capacity Development, Instructional Technology and Distance Learning and Diversity and Study Abroad Programs. Does the audience get to participate? There will be opportunity to mingle and discuss ideas and then elaborate on them via white boards and post-its. Presentations will be archived online so you pick up the conversation via social media. Is it free? Yes it’s free! Join us! Your idea could be "the next big thing!" Separated bike lanes: do they improve our city riding experience or transform previously harmonious streets into splitting headaches? Read about a bike wreck, especially a bloody one, and the first thing you want to know is whether the cyclist was wearing a helmet. Call it curiosity, call it a tool to reassure ourselves that the same thing won’t happen to us, but we should really call it what it is: victim blaming. “Head injury accounts for about a third of all bicycle injuries and about three-quarters of bicycle related deaths, so these are some pretty shocking numbers,” says lead author and emergency medicine physician Christopher Fischer, MD. Yes, doc, that is shocking. But what are we supposed to take away from this? Either 1) bicycling is so dangerous that we all ought to avoid it — health and societal benefits be damned — or 2) all those Hubway cyclists are asking for it — they’re bike-fatality statistics waiting to be compiled. The Bar Fly has an incredible story: designed by Above Category's General Manager, Woody Tate, prototype machined by Woody's father-in-law, stress-testing blueprints for its production mold drawn up by a local boy-genius, exhaustively tested by the Above Category team and friends, and put into production with a United States manufacturer...it can't get more local, more American entrepreneurial spirit, than this! 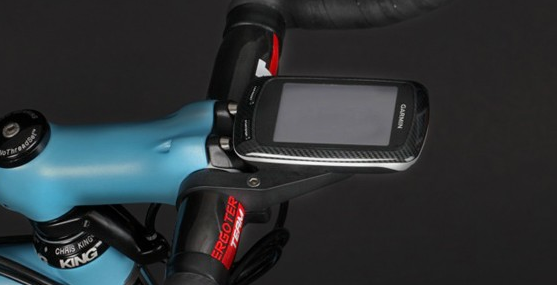 "Out of the box, using a stock mount, the Garmin 500 is mired with poor visibility, is unsafe, and leaves your bike with a tarnished aesthetic. After my first experience with the Garmin 500 I went to work designing The Bar Fly. The Bar Fly’s first iteration was constructed out of a white plastic cutting board in my living room using simple tools. I consulted with my 76 year old Swiss father in law and we polished off a new design. Laboriously using a manual milling machine a new prototype was fabricated and sent out for testing, then consequently broken. Refinement and R&D ensued." Finally, after an overwhelming amount of anticipation, a year of development, racing, training, and redevelopment, The Bar Fly is poised to land where it belongs, centered on the handlebar, level with the stem and in clear view presenting the safest and most aesthetic position possible for your Garmin 200, 500 and 800 cycling computers. The Bar Fly is designed in Marin, ethically constructed in the USA with the finest materials, and distributed by Above Category. Duuuuuuuuude! The PARTY BELT is the ultimate party companion. How many times have you rolled up to the spot with your personal stash of brews only to have them lifted out of the fridge by some freeloading scumbucket? Keep your little buddies safe, insulated and close at hand with this contraption of ours. Put it on one of our Webbing Belts and where it around your waist or go all desperado and rock it bandolier-style, it's up to you homeboy! You can even combine it with a Hip Bag or another PARTY BELT for DOUBLE THE PARTY, BRO! True it is not a bicycle, but it is bicycle related! The boys over at Bike Jerks just made available these chuckle-tastic T's. 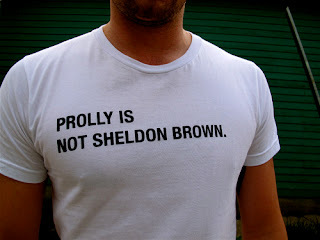 When I first started riding I was made aware of Sheldon Brown almost instantly by the guy who was my bike guru. Since then I make frequent visits to his website for guidance and ideas. Prolly, being the new school and unwarranted "bike expert". Leave it to Jeff Frane and company to keep it real and show respect to the real BIKE GURU!! April 28th: Over 3,000 gathered at the Meadows for the biggest cycle protest ever seen in Scotland! Pedal on Parliament took place on Saturday 28th April in a day that combined sombre moments with an air of celebration. After a minute’s silence, observed by the crowd of more than 2,500 strong according to Lothian and Borders Police, a mass ringing of bike bells, horns and cheers marked the start of the ride from the Meadows to Holyrood. The ride passed without incident, with the police closing a number of junctions temporarily to keep the ride together in a safe manner. The ride was notable for the large number of families and children among the throng, including kids on balance bikes, with stabilisers, in child seats, tagalongs and pedalling under their own steam. We think there may have been a lot more than 3,000 cyclists there but we are happy with the police estimate of 2,500 – 3,000.What we know is that cyclists en masse took up the whole of both George IV Bridge and High Street – as far as the eye could see. COLUMBUS, OH – As a way to bring awareness to an inexpensive way to prevent injuries and death to children, the Ohio Chapter of the American Academy of Pediatrics (Ohio AAP) is sponsoring Bike Helmet Safety Awareness Week from May 7-11, 2012. The safety awareness week is part of the statewide public awareness campaign, Put a lid on it! Bike Helmet Safety Awareness, encouraging adults and children to wear helmets while riding bikes. According to Sarah Denny, assistant clinical professor of pediatrics at Nationwide Children’s Hospital in Columbus, Ohio, a $10 bike helmet saves a healthcare system $41 per child. In 2010, the number of people injured by not wearing a bike helmet was 51,000, and apart from the automobile, bicycles are tied to more childhood injuries than any other consumer product, including trampolines, ladders and swimming pools, said Denny. COLUMBUS, Ohio, May 1, 2012 /PRNewswire via COMTEX/ -- The world's first molecular nanotechnology company, Zyvex Technologies, and ENVE Composites announced an exclusive partnership to provide a bicycle rim specifically for downhill mountain biking that uses the latest advanced materials comprised of nano-enhanced carbon fiber. This new bicycle rim gives a significant competitive advantage to the downhill cycling market as proven during the last year in development and testing. The ENVE DH rim provides performance benefits to all downhill cyclists including those that compete at the highest levels of World Cup racing. ENVE used Zyvex Technologies' nano-enhanced carbon fiber technology called Arovex, which is a carbon nanotube and graphene engineered composite material that uses the proprietary Kentera technology to create chemical bonds on the carbon nanotubes. It provides an advantage in toughness without compromising strength. It also protects from fracture damage. ENVE has an exclusive license for this advanced technology for cycling applications. The Bay Citizen's Bike Accident Tracker!